According to Analysys, Chinese online advertising market was 3.229 billion yuan in 2005, growing 59.83% year over year. Sina, Sohu, Baidu, and Yahoo ranked top four. 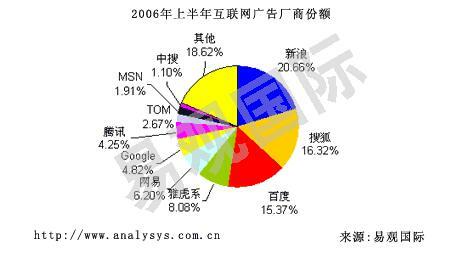 In the first half of 2006, Chinese online marketing reached to 2.095 billion yuan. Though the top four are still the same, the market shares numbers have changed quite dramatically. In the first half, Baidu rapidly expanded market share to 15.37% from last year's 9.51%. At the same time, Google and Tencent also gained market shares. Google increased it's market share by 1.1% to reach 4.82%. Tencent share increased to 4.25%. Yahoo's share slides to 8.08% from 9.48%. Netease also saw it's share drop to 6.2% from 7.41%. For the whole year of 2006, the market is predicted to reach 4.387 billion yuan or about $540 million dollars. Search engine market will reach 32.37% of the total online advertising market. sources of data and figure were from Analysys.